It’s amazing what will be ignored or forgotten in order to try to explain the state of the world when it strays so far beyond bounded conception. Commentary views the state of economic world as wholly separate dots, disparate systems only tangentially connected through nebulous trade terms and hard currencies. The world was once that way, though perhaps even then not quite as idealized as all that. In any event, there is no separation anymore and the melody of turmoil in one is the harmony of dysfunction of all, the dark base note of the unifying factor. The major events of this week certainly surround China but not there alone. The universal contention continues to be that the PBOC has devalued in order to boost exports; to which the PBOC has denied. Far be it for me to take a central bank at its word, especially one as the most emblematic statist engine, but in this case they are more than believable. Two days ago they were, in the words of the Wall Street Journal, “raising questions” about their “commitment” to devaluation and the Journal’s assumption about what “market” was driving what. Last night, the PBOC, totally contrary to all this convention, actually fixed the yuan higher. Bond yields rose in major markets on Thursday after China’s central bank reassured investors there was no reason for its currency to keep falling, but oil prices fell to six-year lows on supply concerns. The higher currency fix signals that whatever great “dollar” run hit the China funding markets this week may have passed – even if only temporarily. In short, the actions of the PBOC, seen in light of what was a convertibility mini-crisis, a “run” of sorts, make sense where the yuan fix as some kind of “stimulus” in devaluation does not (or is at least far too inconsistent to be explanatory). The PBOC held the yuan steady to a near plateau for five months hoping for cessation of “dollar” pressure, but, like a coiled spring, it only intensified until there was no holding back anymore. The key about the fix is China’s banking and the “dollar” short; to hold the yuan steady under “dollar” pressure meant something was supplying “dollars” somewhere. The fix has the effect of limiting, under duress, the quantity that banks can source from the “market.” So if the PBOC was no longer able to supply sufficiently as pressure exceeded some grand threshold, assuming that is what kept the yuan suppressed those five months, they had only two choices at that point – let the fix drop significantly so that China’s banks could find their “dollars” at whatever price or face illiquidity to the point of default, “dollar” insolvency and all the rest of the nastiest consequences. The band-widening announcement came as China’s central bank in recent weeks has engineered a decline in the yuan’s value to drive out speculators betting on the yuan’s continued rise and to introduce greater two-way volatility into its trading, in a bid to pave the way for expanding the band. The PBOC has done so by guiding the parity rate lower and by instructing big state-owned Chinese banks to aggressively purchase dollars. It’s a far different narrative but essentially the same as what happened this week. And the yuan itself was clearly under serious pressure at that time, “devaluing” significantly against the “dollar” just as has been done now. 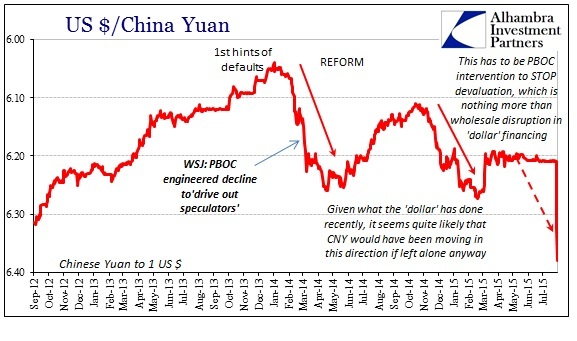 The only difference was the yuan’s behavior leading up to the big move; in 2014 the yuan was “freely” getting pummeled by “dollar” illiquidity and turmoil while this year it had been clearly and artificially suppressed until the PBOC could stand the pressure no more. As much as the PBOC is sitting atop a multi-trillion dollar “reserve” excess, meaning that it seemingly should be easy for Chinese companies to obtain US dollars, there are enormous obstacles to mobilization, not the least of which is the daily currency band. Thinking about this in terms of eurodollars and global wholesale finance, the Journal’s theory about punishing speculators does not explain enough to be compelling, amounting to more of a latent PR backstory. Instead, Chinese banks “aggressively” purchasing dollars, in quantities sufficient to cause notice, might rather be indicative of a dollar shortage among Chinese companies (and banks that lend those dollars to the corporate sector). Given the behavior in copper, and the foreign distance from default rumors, the dollar shortage actually makes more sense, and more complete sense. This liquidity shortage is bad enough that the PBOC has been forced to widen its currency band enough so that banks can rollover sufficient quantities to avoid dollar insolvency. Thus, the Chinese banks are not being directed to bid “aggressively” for dollars, but rather their own survival, and really the survival of China’s economically planned “miracle”, is driving them to desperation. The reason for the changing mainstream narrative is simple – the world in 2015 appears much more dangerous and hostile than in early 2014. Last year, it was a forgone conclusion that the global economy was headed forthrightly for great fortunes and glowing monetary success. Thus, the PBOC could be seen as cleaning house. Now, everything has changed even if the mainstream will not yet allow, still, the dramatically darker realization to cloud future expectations. Thus, the PBOC is viewed as favoring “stimulus” even though it is the same actions carried out under the same kind of duress. Both of those incompatible assertions fall under the category of misunderstanding. As mentioned earlier this week in this same Chinese context, economists and commentators just don’t understand wholesale finance on any scale. With that operational and theoretical vacuum, it is filled instead by groping attempts to describe from a very limited perception (think Socrates’ allegory of the cave).